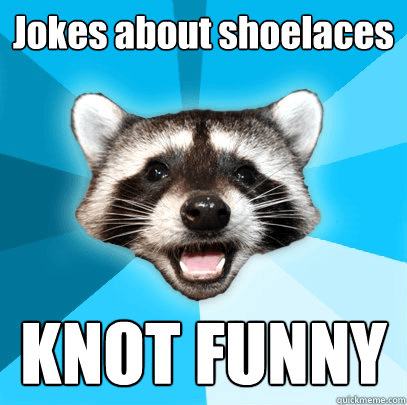 Believe it or knot, there are different ways to tie your shoelaces! You know it’s going to be a great blog when it starts with a pun! But onto a serious note, many people don’t know that there are other ways to tie shoelaces, rather than just the standard method we are all taught as kids. 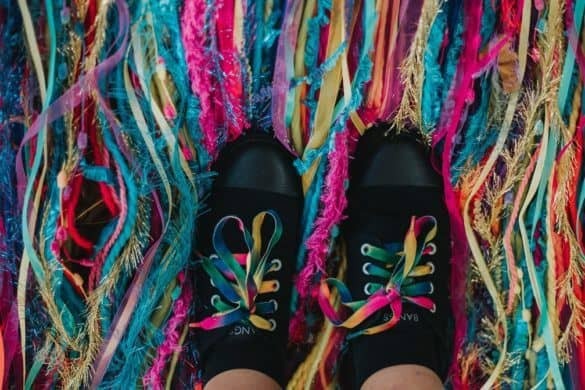 Shoelaces are responsible for fixation which keeps our feet nice and snug in our shoes and are an integral feature of a good shoe. There are many reasons as to why people may need to lace their shoes different. These include wide feet, narrow feet, common deformities such as bunions and hammer toes, and different sized feet. Below we have attached an image from the Athlete’s Foot that sums up our ideas pretty perfectly. It illustrates different ways that people can tie their shoelaces depending on their foot type. People with a high instep generally find it difficult to tie laces in most shoes due to the shape of their feet. They require shoes with extra depth to accommodate their feet and often have issues of irritation on the tops of their feet, including blisters and feelings of numbness or pins and needles. By using this lacing method, pressure is reduced on the top of their feet and they are able to still have the fixation they require to support their feet appropriately. A common presentation to podiatrists are bunions or a wider forefoot, also known as the region including the ball of your foot and your toes. 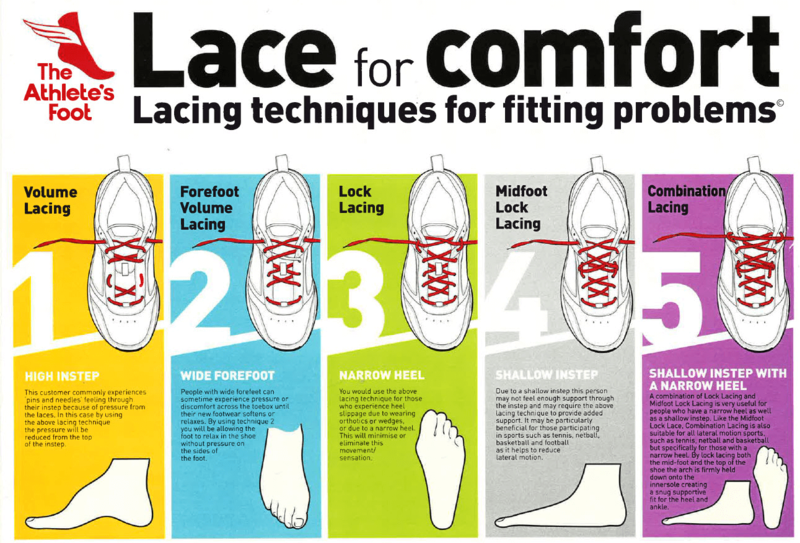 If shoes are laced too tight in the forefoot, it can lead to the toes being pushed together. Due to this, blisters, corns, callus and sometimes nerve entrapment can occur. Similarly to those with a high instep, people can often get feelings of numbness and pins and needles in their forefoot if the lacing near the end of the shoe is too tight. This style of lock lacing is perfect for people who have a narrow heel or those who wear orthotics that may cause them to slip out the back of the shoe. 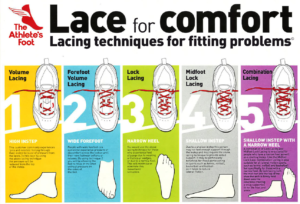 This lacing technique helps to lock the heel and the bottom of the ankle to provide support and prevent slippage. This is essential in sports where rapid change in direction is required in sports such as netball, basketball and tennis. Flat feet, also known as a pes planus foot type, is another common presentation to podiatry clinics. Flat feet require extra support through the middle of foot, as the arch of the foot is lower to the ground. This type of lacing allows the middle part of the shoe to be a bit tighter. The structures that are typically strained in those with flat foot are more supported through this lacing technique. This particular lacing method is perfect for those who need a little extra support all round. It combines both lock lacing and midfoot lock lacing seen previously. It is ideal for those playing sports such as tennis, netball and basketball, as it prevents excessive movement of the foot within the shoe.